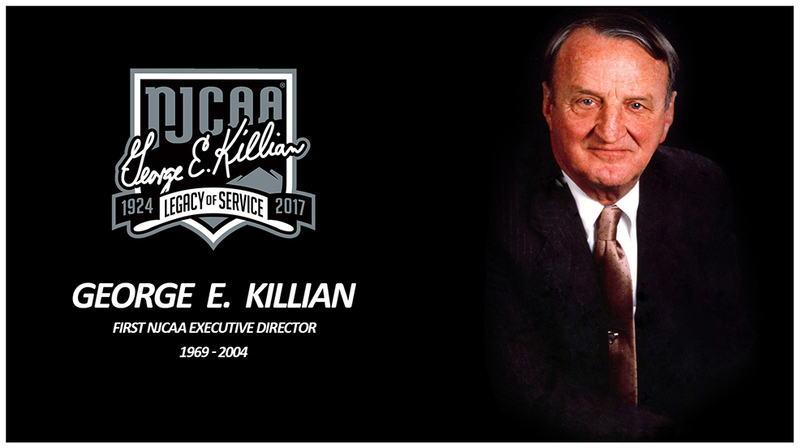 DAPHNE, Ala. – The United States Sports Academy mourns the loss of international sports leader, Academy honoree and longtime Board of Visitors member George E. Killian, who died Thursday, 6 December 2017 at the age of 93. Killian received an Honorary Doctorate from the Academy in 1997 and was honored with the Academy’s Eagle Award in 2007. The Eagle Award is the Academy’s highest international honor and is presented to a world leader in sport to recognize that individual’s contributions in promoting international harmony, peace, and goodwill through the effective use of sport. The recipient of this award must have tempered strength with keen judgment in using authority wisely as a means of bringing nations together through sport for the betterment of mankind. One of the most well-known and respected leaders in international sport, Killian is the former president of the International University Sports Federation (FISU). Killian also served as the longtime director of the National Junior College Athletic Association (NJCAA). He was inducted into the NJCAA Baseball Hall of Fame in 1987 and the NJCAA Basketball Hall of Fame in 1988. Under his leadership and vision, the NJCAA in 1975 became the first national collegiate athletic organization to add women’s athletics. The NAIA and NCAA would follow the NJCAA’s lead in adding women’s athletics in 1980 and 1981, respectively. Killian was a member of the International Olympic Committee from 1996 to 1998. He also was the President of the Pan-American Basketball Confederation (COPABA) from 1983 to 1987, and FIBA from 1990 to 1998. Killian also served on national boards such as the United States Olympic Committee and the NCAA Committee on Junior Colleges. He served on 16 additional national organizations during his career, as well as more than 20 international sports affiliations. He spoke many times before the U.S. Senate and House committees in Washington, D.C. on sport related issues. Killian served at various times and places as a head coach of basketball, track, cross-country, golf, and tennis. He received more than 30 national awards for outstanding coaching and community service including: the International Olympic Committee’s Olympic Order; “Gold Medal” from FILABASKET Athens, Greece for contributions to the international philatelic basketball community; Induction to the Women’s Basketball Hall of Fame, Knoxville, Tenn.; International Basketball Federation (FIBA) Order of Merit and Siler Plate; and the Atlanta TipOff Club, Naismith Men’s Outstanding Contribution to Basketball to mention a few. Killian earned his undergraduate degree in education at Ohio Northern University, Ada, Ohio and his master’s degree in education from the University of Buffalo in New York. He received three honorary doctorate degrees for his service and dedication to sports. Internationally he was honored with a professorship from Beijing Foreign Studies University and a Ph.D. from Yeungnam University in Daegu, Korea. George Killian is one of the many reasons I pursued a career in Sport. My first “real” job was at an NJCAA school in western NY and George took the time to give a 26 year old, who thought he knew more than he did, guidance and encouragement to continue down the path of lifetime in sport. Rest In Peace George, Thank you for love of Sport and of learning! George, had a passion for sport and teaching sport, to the children of the world, always a strong supporter of doing the right thing in the right way.